From gourmet delights to hole-in-the-wall bites, these are the best. When no one was looking, the taco, that humble snack of filling wrapped in a tortilla, conquered the globe. It’s now available in myriad variations on menus everywhere. Dallas is no different. Here, homegrown renditions and south-of-the-border classics share real estate with Korean tacos and gussied-up jobs. It’s fantastic. More fantastic than I imagined when I embarked on a mission to learn everything I could about tacos. At the time of this writing, I’ve visited approximately 235 taquerias, restaurants, shacks, and sidewalk stalls from New York to San Diego. The majority, however, have been in North Texas. After patronizing so many establishments, the most critical lesson I’ve learned is that tacos, whether wonderful or awful, aren’t confined to the storied holes-in-the-wall or to dives. Treasures can be found in unlikely places, not only where X marks the spot. What follows is a collection representing our area’s best tacos. Some are popular. Some are hidden in plain sight. Others require a willingness to travel beyond the El Dorados of Oak Cliff and East Dallas. My hope is that you’ll join me on the journey through these pages and that your mind will be as open as your stomach. When people ask for recommendations, I point them to this Bachman Lake tortilla factory and La Banqueta (see No. 2 below) in East Dallas. The response is usually a stunned gaze. “Why would I ever go there?” is written across their faces. And that’s fine. Mealtime lines at both establishments can test a claustrophobe’s tolerance. However, those who venture north and east are rewarded with Dallas’ finest tacos. Four-year-old La Nueva is owned by Gloria Vazquez Martinez, a native of the Mexican state of Zacatecas, whose father opened the first La Nueva in 1968. There are now six family-owned spots in Rio Grande, Zacatecas; another La Nueva in Lewisville; and several other operations in the area. At the Webb Chapel branch, the specialties are guisados, thick stews that are as street food as street food gets in Mexico, plopped into springy tortillas made from the inferno-producing machine at the front of the place. The guisado verde is a green conflagration of pork. The guisado rojo with strips of nopalitos (cactus pads) lashes out at the palate with less intensity—but not by much. Further down the Scoville scale is the iridescent and rich mole. The barbacoa at La Nueva comes in three forms: the common beef head, borrego (lamb), and beef cachete (cheek). Though all are excellent, it’s the fatty cachete with its palate-hopscotching flavor that is incomparable among the trio. Like all the tacos at La Nueva, the vermillion chorizo and the umber-colored pastor must be enjoyed elsewhere. This isn’t a restaurant. There is no seating. I suggest the shopping center’s sidewalk. You could consume them in the relative comfort of your car, but tacos this great demand space and respect. The other taco joint I recommend to those who seek our premier taquerias, Tacos la Banqueta, is a DFW chain known for its DF (Mexico City) noshes. Chief among them are what I call the shack’s holy trinity served on small, two-ply corn tortillas: cabeza (cow head meat), lengua (beef tongue), and suadero. The latter, La Banqueta’s signature meat, is a braised cut of steak finished on the griddle, sealing in the juices with a charred exterior. It’s often mistaken as being dry, instead of nuanced, and is a matter of pride for the operation. So proud are the taqueros that first-time visitors to the flagship Bryan Street location are treated to a free suadero taco. That outpost, marked by a garish yellow facade doing double duty as a menu, shares real estate with a liquor store and its patrons. But that shouldn’t prevent you from ordering the cabeza, luminescent and unctuous, better slurped than chewed, not to mention lengua, a 2-inch chunk of tongue. There’s no denying what it is: astonishing. Equally amazing are the Gaston Avenue gas station and Arlington Pioneer Parkway branches (I haven’t been to the newest one in Fort Worth, yet). Each has table seating. The Arlington restaurant is even full service. The licks of flames working slow magic on the trompo, the vertical spit on which traditional pastor (also called trompo) is prepared, are the focal point of this large Irving restaurant’s kitchen. The red-shirt-clad cooks tend to the pork and the bubbling pots of sauces, stews, and offal, while the waitresses in black, some wearing miniature sombreros, curtly take your order. Doña Lencha is not a quiet place. Neither is it a nice place. Get caught taking a photograph of even the salsa roja and you’ll be lucky if you are only escorted out. I’ve had my license plate number taken down. A couple of friends were run out of the joint by the owner’s furious expletives. The tacos in handmade tortillas (available upon request) are worth it, though. The al pastor is as excellent as any found locally: a crunchy, dusty-dark exterior concealing soft pork laced with glistening threads of sautéed onions. The shredded borrego, salt-forward with a sweet finish, is reason enough to make this place the last stop before boarding a plane at DFW. Carnitas here have satisfying bits of skin and fat bridging chopped pork. Intrepid diners can opt for the moronga, Mexican-style blood sausage, similar to the morcilla found in area tapas bars. The filling is metallic in taste, like having a tuning fork pressed against your tongue, while the fried intestinal casing comes off like cracklings. Better yet, pasty sesos (calf’s brains) that take on a mealy texture in the mouth with scant flavor. My advice, load the gray matter with fixings from the salsa bar and prepare for an adventure. That’s what tacos are all about. 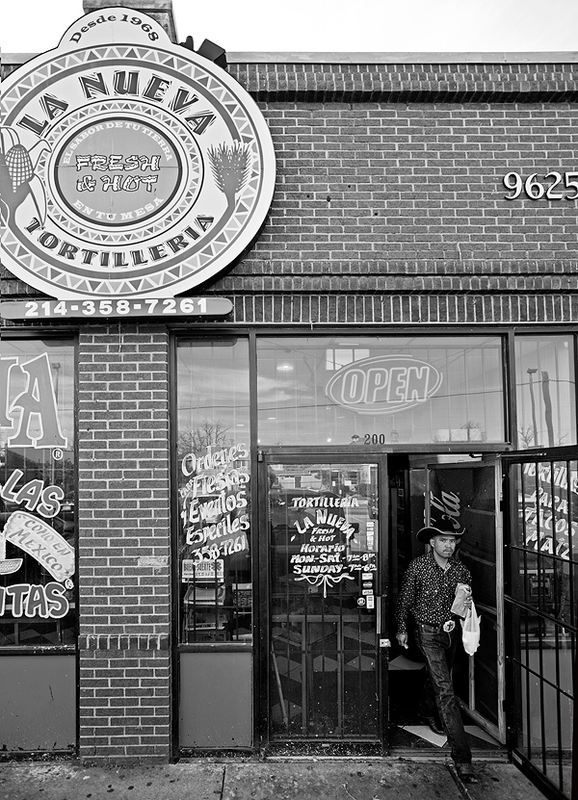 El Tizoncito’s story is as fascinating as the food served at the DF-style fast-casual chain. Owner Leonardo Spencer, who owned restaurants and food manufacturing companies in his native Mexico City, came to Texas because his daughter was under the threat of kidnapping. Spencer sold what he could and brought his family north. A few years ago, he opened the first El Tizoncito in a former Starbucks. Chips and salsa are nowhere to be found in the sleek dining room replete in intricately embroidered, orange and white Otomi textiles on the walls. Instead, El Tizoncito offers a teasing appetizer of black beans. After slurping that down, order the choriqueso, a trio of tortillas smothered by the perfect union of chorizo and cheese that gives birth to a deliciously messy vermillion and white slop, eaten like a taco. The specialty at El Tizoncito is pastor, the meat preparation synonymous with Mexico City. Watch as the trompo slowly turns and roasts achiote- and chile-seasoned pork that gets knots and threads sliced off to order. Get it straight up with nothing but the condiments set on the table—onion, cilantro, lime wedges, pineapple, salsas—or as an alambres, kabob style with everything on it (sweet grilled onions, mild poblanos, and crispy bacon). You can even order any taco with cheese (a gringa). Sit, eat, and discover a not-so-new form of Mexican cuisine. Visiting each and every taco shop in North Texas is impossible. Businesses open and close, change ownership and staff—not to mention location—without a fancy-schmancy press release from a boutique agency. Mi Tierrita is evidence of this phenomenon. Once known as El Cebolla, the strip-mall restaurant, across the street from dive bar Tradewinds Social Club, had a new name seemingly overnight but retained its old signage that’s since been replaced. Whatever the quality of previous incarnation’s fare, Mi Tierrita is a whiz-bang place, serving street taco gems like tacos al vapor (steamed) filled with mashed potatoes and cascabel chiles as well as fantastic regional specialties such as piratas and campechanas. Each is bound by mozzarella and wrapped in flour tortillas that have begun to peel like paper and crisp from time spent on the flattop griddle. However, it’s the trompo that shines here. The pork is also used in Mi Tierrita’s hamburguesa estilo Monterrey (a burger from the city of Monterrey, Mexico) that crams a beef patty, avocado, grilled ham, sliced hot dog, cheese, and all the fixings between a sesame seed bun. It’s a Brobdingnagian delight. Open since June 2012, Los Torres Taqueria is one of the few Mexican restaurants in Dallas specializing in the cuisine of the Sinaloa state in northwest Mexico. The family-owned, 80-seat establishment serves barbacoa roja de chivo (goat given a dose of chile colorado), birria de chivo (a cauldron of chest-warming goat meat in an orangey-red broth), and chivo tatemado (the roasted equivalent of birria prepared in a clay pot) as platters, by the pound, as well as in tacos with handmade tortillas (flour and corn), if requested. Request them. The birria can be a little dry in a taco, but when its chile-flecked threads are nestled in blistered, misshapen fresh corn tortillas, forgiveness is immediate. The tatemado has a more pronounced gamey flavor. Its gaminess does martial arts training on your cheeks. It’s stellar. The same goes for the wet, congealed cabeza and the carne adobada, soft, marinated pork nuggets. Though they’re unnecessary, try one of the salsas—I’m partial to the creamy green; the eviscerating red is also recommended—and toppings from the condiment bar. Ignore the free wi-fi and consider Los Torres’ hot dog, a bacon-wrapped frankfurter topped with avocado, onions, tomato, and a dose of ketchup and mustard treasured as much in Sinaloa as it is in Sonora, the border state to the north. Every day, southbound travelers on I-35 speed past this taqueria in a converted gas station/car wash not knowing the wonders of its tortillas (corn and flour) wrapped around a mouth-puckering barbacoa that demands seconds and fluffy eggs pockmarked by piquant chorizo. Easily consumed in two bites, the breakfast tacos make ideal pre-road-trip fuel. Lunchtime’s griddle-smacked slices of fajita (beef or chicken) as well as the pastor, offering crisp and tender bites, are excellent. Even the picadillo, a melee of ground beef, potatoes, and onion, is praiseworthy. Get them at the walk-up window, where ringing a doorbell gets an employee’s attention. Afterward, enjoy them in your car or in the covered patio space. You can also order in the drive-through and bolt to your destination quickly. Tacos ought to be consumed hot. It’s Cool & Hot’s snow cones that should be eaten cold. 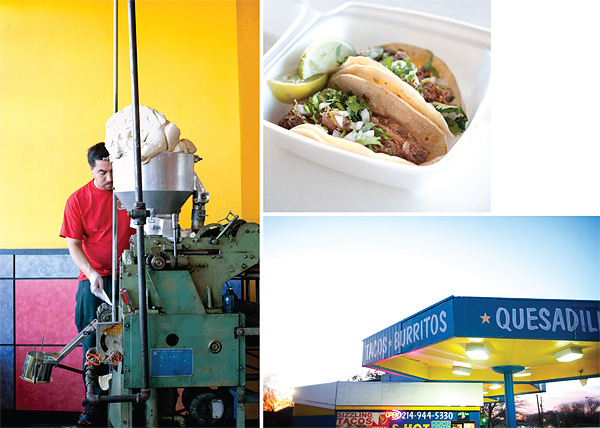 Around the corner from some of Jefferson Boulevard’s taco houses sits Taqueria Tiquicheo. As such, the Lilliputian joint named after a city in the Michoacán state is easily missed. That’s even with its lemon-and-lime facade and words declaring it reigns supreme when it comes to tacos and salsa. Pass it by and lose out on the pinnacle of deshebrada de pollo in Dallas. The preparation—chicken stewed in a fierce concoction of tomatoes and chiles until it’s transformed into a finely shredded mass—is served in house-made corn tortillas, sturdy enough to hold back the wave of garnet-hued juice the meat can’t help but release. At first, the poultry’s heat is like the breezy licks of a campfire when you’re just outside the ring of logs that serve as seating. And then it’s too late. Nasal passages clear. Beads of perspiration collect at temples. The bottle of Mexican Coke at your side is useless. Best to let the heat burn itself out. It does so quickly—just in time to order a second. That is, if you have enough cash on you (Tiquicheo doesn’t accept plastic) to gobble mellow lengua and the other deshebrada, beef. Though the service at this year-old restaurant is lackadaisical—but sweet—the lean barbacoa and crackerjack carnitas are why taco enthusiasts should grab a booth and a Coca Mexicana at this East Jefferson haunt. El Pueblo’s traditionally prepared carnitas (braised and fried in its own fat) is the best I’ve found in North Texas. Crunchy, salty, and silken, the taco is a sight to behold with mahogany, sienna, and black threads running through the shredded pork. Exceptional lengua tastes of the same fat that elevated its porcine companion. A taco al pastor, charred and cadmium orange, is treated with pineapple and onion, providing a counterbalance to the former selections. A cool salsa verde followed by a spritz of lime juice amp up the beef barbacoa that’s wrapped in soft, bumpy yellow corn tortillas fresh enough to render a destructive oil bath gratuitous. Pay attention to the seating arrangement. The next time you visit El Pueblo, it will probably have been altered, a bit of whimsy to accompany the mouthwatering carnitas. At El Pueblo, customers play musical taco chairs. Thankfully, the cooks don’t play around. There’s no need to toy with choice tacos.